Hip Mama's Place is a great blog I recently discovered. 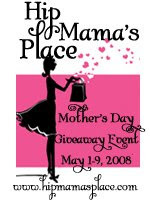 They are hosting a great Mother's Day Giveaway Event that you should go check out right now! Look around while you're there; it's a fun blog to visit. Thanks, Nessa! I will go check it out.